Houston, we have a delay! Control a ship through space sending signals from earth. Beware of delay. Control the unicorns and create a strategy to deafeat the lions using cupcakes and ice cream as weapons! Learn to see the world in new perspectives! Face a series of challenges and fight for your life! After you die, the destructible tiles are not regenerated, which is very frustrating. There is also no indication that the ground will be destroyed. The game is fun, apart from a few frustrating bits. New video upload! Check out the basic mechanic working! This colourful fella is going on a journey of self discovery when he realizes that the world is a lot more than what he was used to. 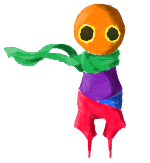 The player will advance in the game by finding new colours, which will teach the character to see the world through new "lenses", showing new parts of the world that were otherwise invisible. This is a top-down exploration game featuring no combat.